Steak ‘n Shake is, for the most part, a regional burger chain, so if you have never heard of this burger restaurant, it is understandable. They are not a typical burger joint and are better categorized as a diner because a food server brings you a menu. Their cheeseburgers are good, and I love the onion rings. However, they are probably equally well known for their ice cream, shakes and other desserts. 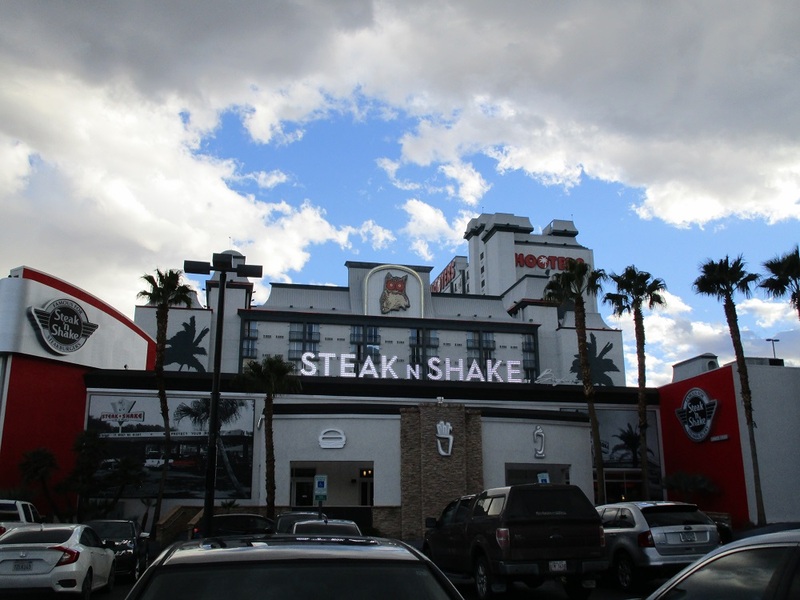 Although we have had a Steak ‘n Shake in Las Vegas for many years, it is located inside the South Point hotel and casino. This is at the far south end of Las Vegas Blvd., and is well beyond anything that could be remotely considered the Strip. About a year ago, we had one open up within walking distance of the Strip. It is located on Tropicana Ave., inside the Hooters hotel and casino. It has been billed as the largest Steak n’ Shake in North America. Recently, I was there. It is large inside compared to their other location at South Point, and this is likely the reason I was seated immediately. Every time I eat at Steak ‘n Shake at the South Point location, I have to wait in line. Granted, it’s only for a couple of minutes, but this may have to do with size difference. Hooters, for those not familiar with the Strip, is located next to the Tropicana Hotel and is across from the MGM Hotel, on Tropicana Ave.